Well, you can see I have a long way to go with the interior. One of the things that motivated me to take it all apart was a heavy layer of dust on everything. I think one of the windows had been broken and the car had been regularly driven on a dirt road. 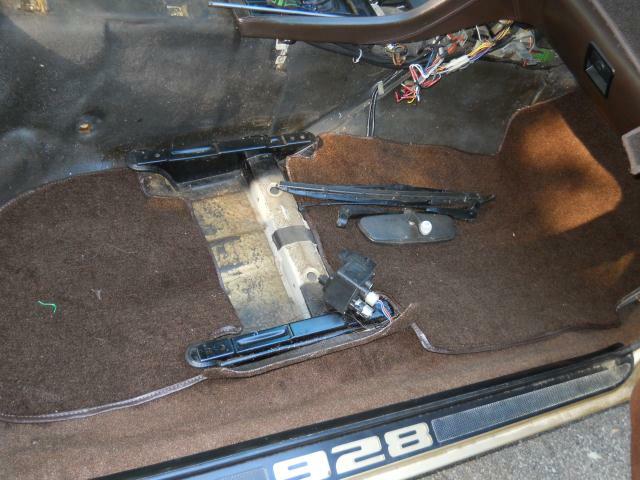 It had also been subject to a robbery attempt and the sun roof & door locks had been damaged. 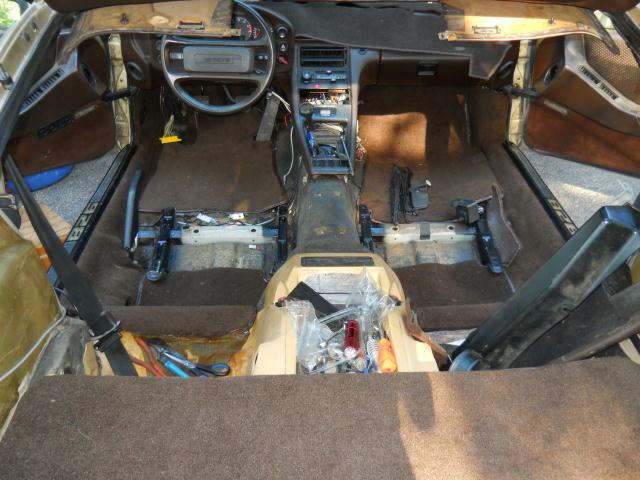 I think I have the parts to fix the sunroof now but while I've come this far, I need to deal with the seats and the carpet. I'm still studying ideas for how far I'm going to stray from the basic brown and tan theme. Brown interiors are probably my least favorite but the colors do go well with the gold paint and sometimes less is more - especially for an inexperienced trimmer like me. 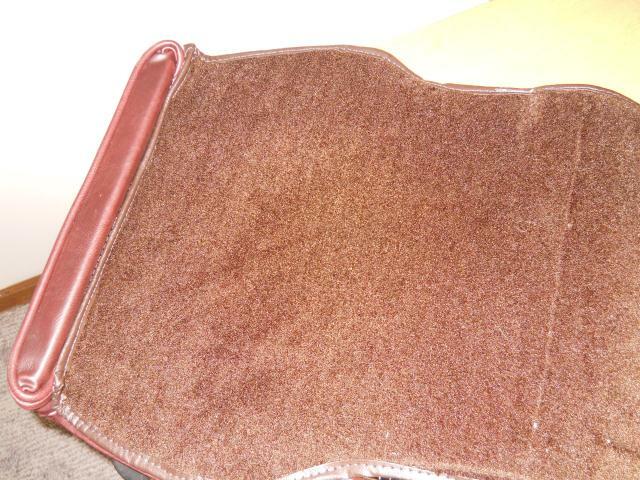 After much consternation, I've set out on a aggressive goal to re-trim it myself and use the dark brown with a neutral fabric (in place of the tan colored pieces) I have done some interior work before but it is really limited to removing and replacing carpet, seat covers etc. 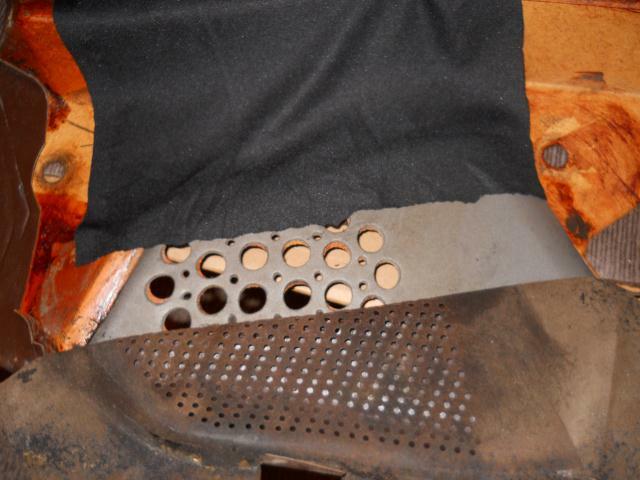 This car will be a big step for me with actually sewing the seat covers and carpet myself. Here are a few pictures of what I have to work with. 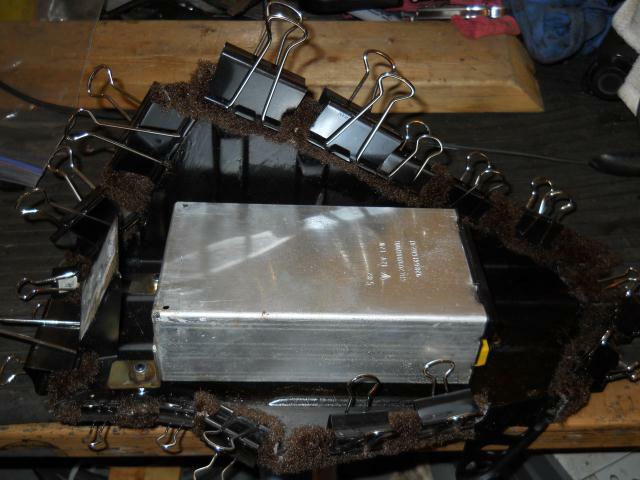 The first steps are all done, the engine has been overhauled and is all back together. Generally the car is running and driving well now. The windshield has been replaced along with a lot of little work on things like blower motor, windshield wipers, brakes and some of the electrical work. 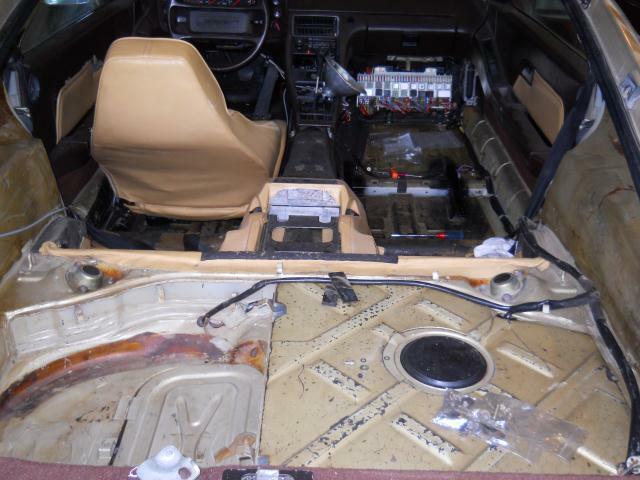 So on the interior, I only need to make sure things are working as I bring it back together. I bought 3.5 yards of carpet (and that wasn't enough) along with 30 yards of brown binding tape. 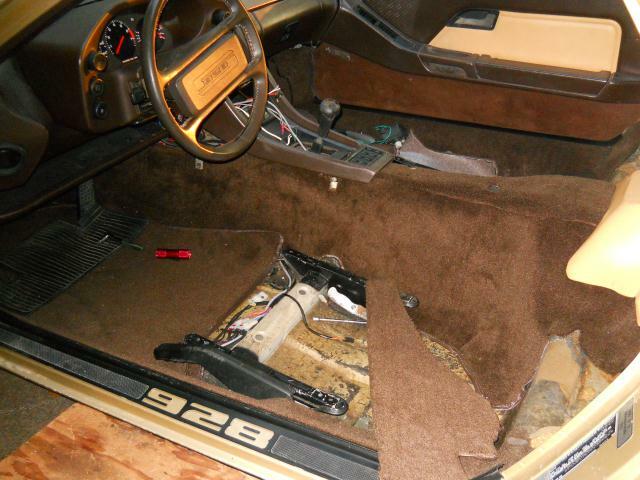 The carpet that I chose was a cut pile like what Porsche used originally but has a vinyl backing (not just cloth). I think this was a mistake because the extra thickness of the liner means it is harder to fold over an edge and some areas where I have to be glued to metal (no staples) which is a challenge for the my rookie gluing technique. Maybe an upside though in that water won't go through it so readily. I used the old pieces of carpet as patterns to cut out the new pieces. 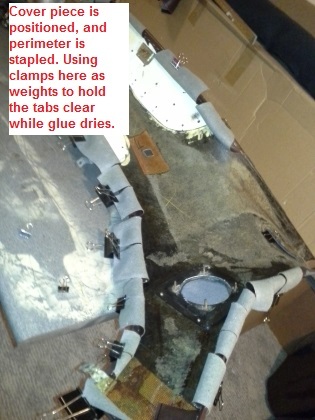 I then sewed the binding tape and made holes needed based on the old carpet. The old carpet was so crusty an sticky, I didn't even want to touch it but it served me well for a pattern. 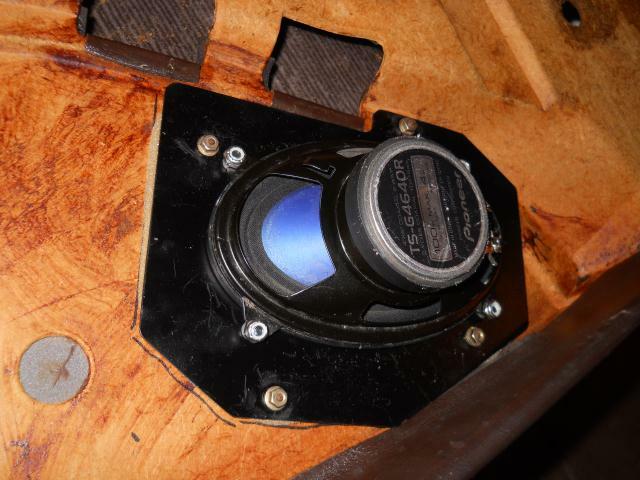 Next, I gave the inside of the shell a serious bath, a lot of it had to be wiped down with lacquer thinner to get the old contact cement and dirt off of it. These pics take place over many months. 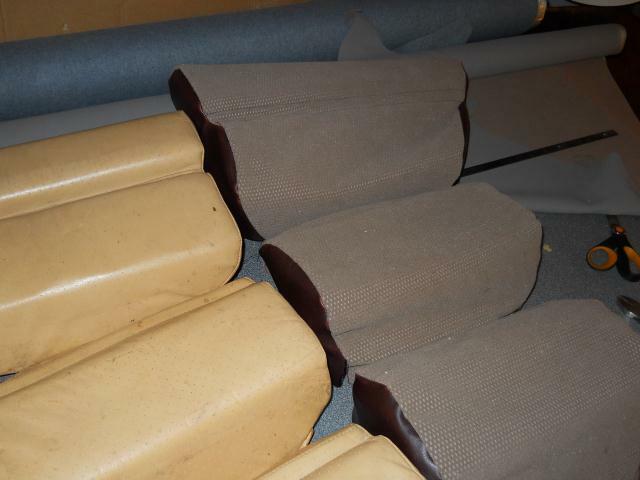 Here you can see the first trial fittings of the carpet pieces. In review, I think the DIY carpet was pretty easy and a good place to start given my rookie level with a sewing machine. I was really slow at the corners (walking the needle manually) and its still a bit amateurish with wavering stitching but still I happy with it for a first go. There are a variety of pieces that have to have carpet glued to them, here are a couple of the first pieces. The cement takes several hours to cure so this was a sort of time consuming work then wait cycle. 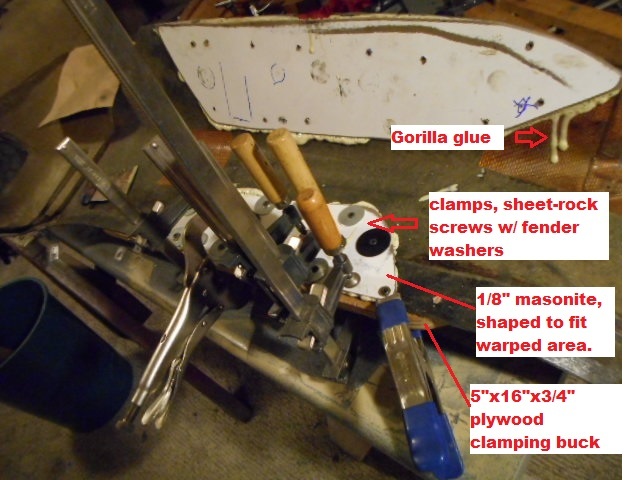 Later I learned to use a heat gun to quick cure the glue and a good pneumatic stapler for insurance. 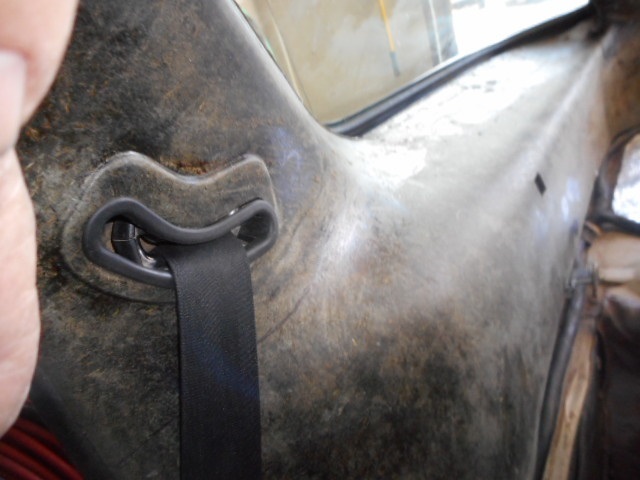 Trying straighten the rear quarter panels - they get warped when the sun dries the leather. 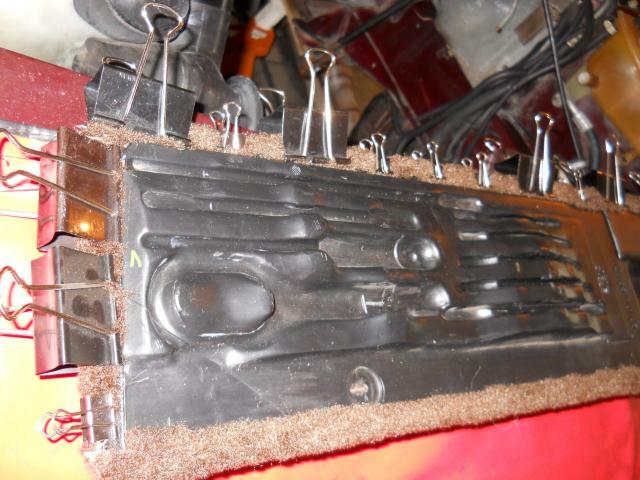 After some various efforts, I gave up and pulled the leather, stripped the open cell foam from the panel and came up with this method to straighten the panels. Its holding fine and hopefully the added thickness won't affect fit. (see test fit pic, later). I really think this is the way to get them straight and strong again. 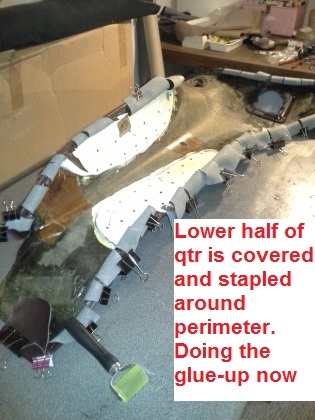 Both sides are straightened now and one has been re-installed as a test fit. Side note: So far, my attempts at recovering other simple parts has not gone well at all. It seems this is a whole art form in itself, so I've put the covering the quarter panels off till I work out a few of the mysteries. 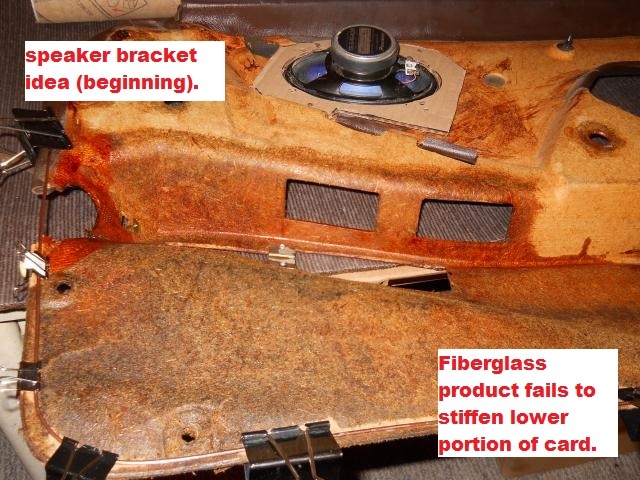 Another problem is controlling the color as some of my original pieces are faded brown or tan leather, the new vinyl, which is tobacco (meaning the same as OEM dark brown but with a tinge of red). 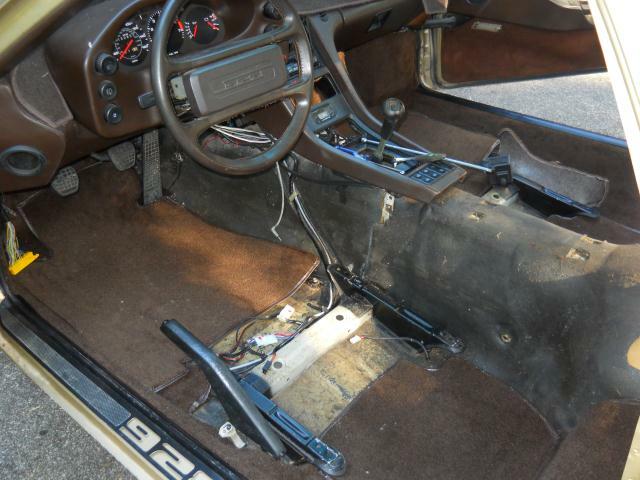 This probably seems like a crazy low-budget approach but this was supposed to be my cheap Porsche project. 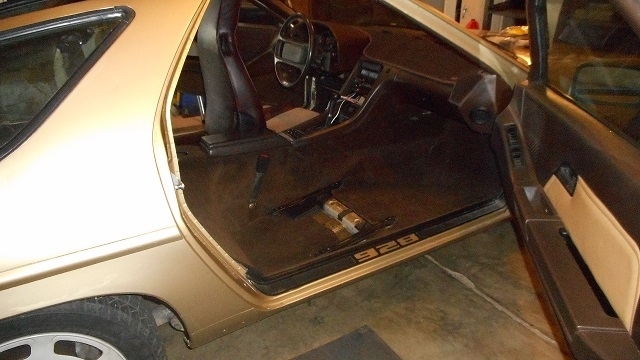 The door cards needed some love. 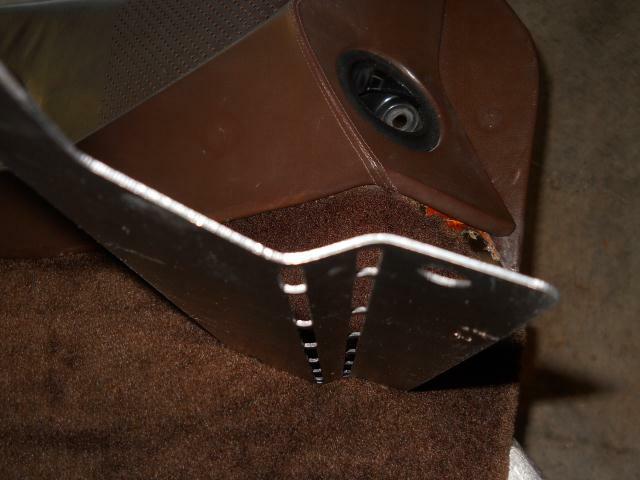 Inserting new speaker grille cloth, the old stuff was just dust. 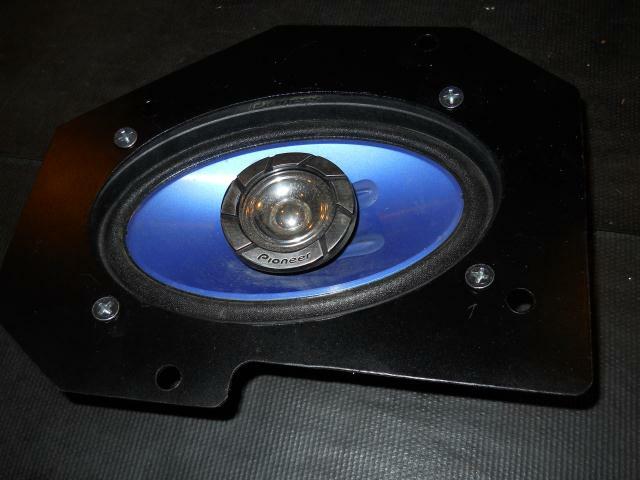 Some speaker brackets that I made - these later failed fitment - speaker is too deep. Will have to re-design them with smaller speakers (or something). Damn it, I was proud of those brackets too. Trying to repair a water damaged card. Its pretty straight and strong now but I think it will need a screw in the bottom front corner of the card - to pull it in tight to the door. Overall this actually turned out pretty well. I really like my new Porter Cable upholstery stapler, a good buy for $80 and staples give a huge advantage to holding pieces in place long enough for the contact cement to cure. My version of the door handle reinforcement plate. Simple but it increases door weight by too much. I need to recut them from thinner material - some day. 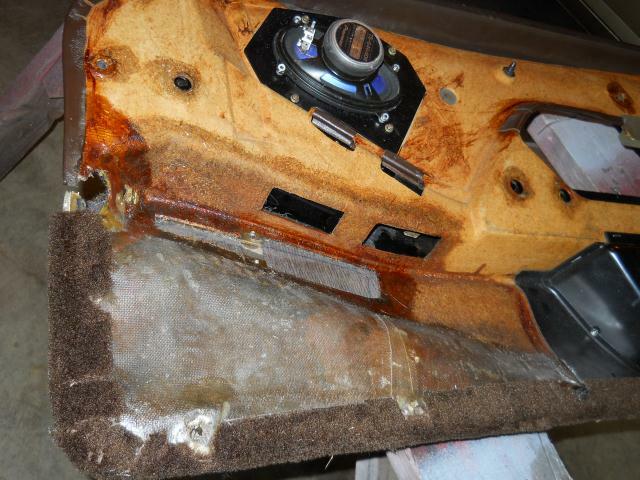 OK, so the rear console is a pretty big challenge for a rookie trimmer such as myself. 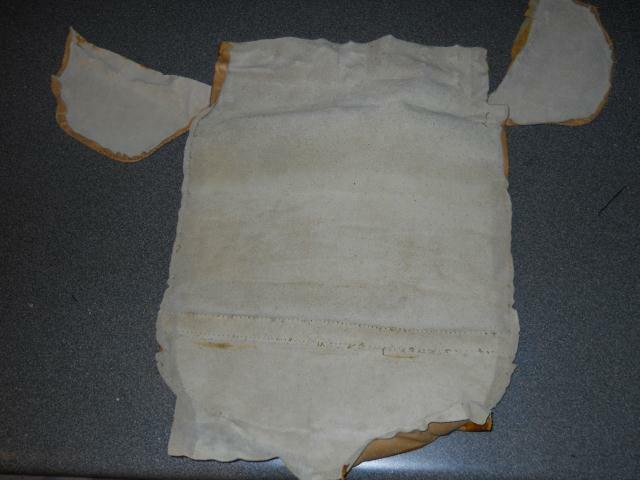 It has sewing work and some pretty difficult fitting work. Even after some success with the carpet, the seats look pretty scary. Will have to look around for some easier places to build confidence. 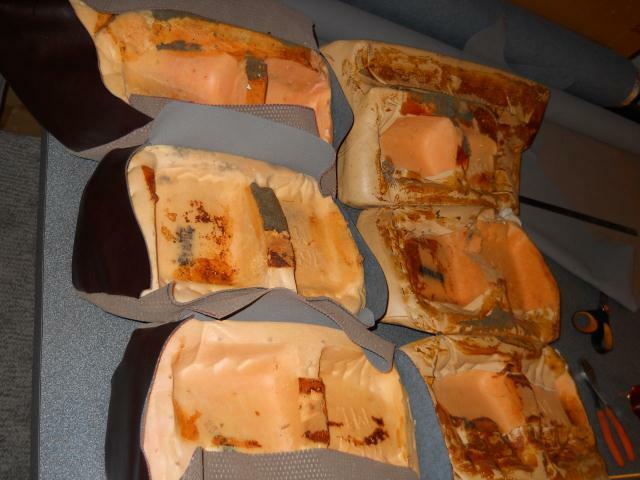 The first problem with the seats is choosing what materials to work with. 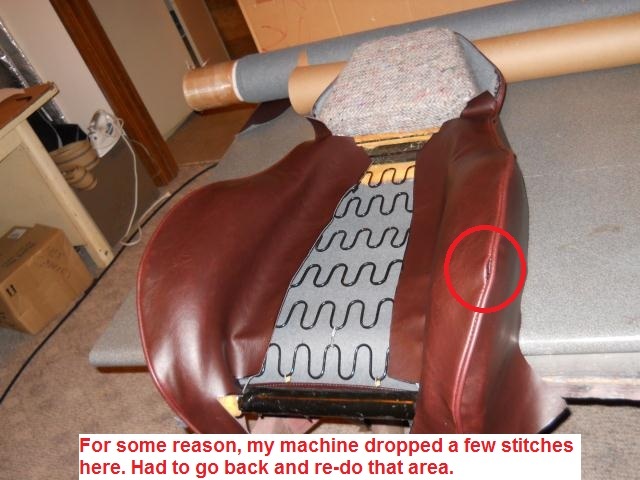 Leather would have been best but I didn't think a rookie trimmer should go straight to such a high priced project. Just vinyl would have been good too but I was worried about making that seam across the center of each section straight enough; and if I was going to have to re-do it a time or two then it would have to be fabric. 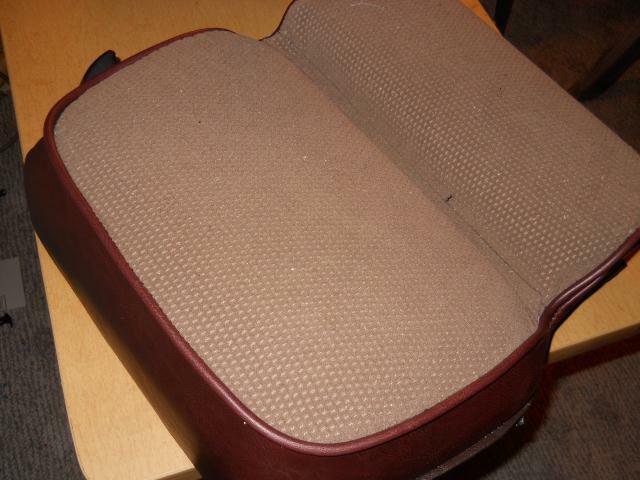 Anyway, I chose a simple fabric with vinyl sides (actually, faux leather). The vinyl is a little more red than I wanted. This a little like choosing your car's new paint color from those iddy-biddy paint chips. No going back now though. 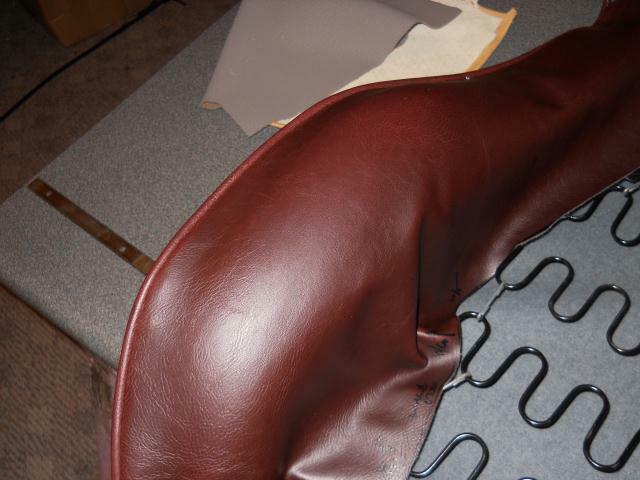 This vinyl is Symphony Vintage Tobacco, which is supposed to show slight changes to stress just like leather does. Its a little stretchier than other vinyl's too. The second problem then was the welt cord and getting a color that matches the vinyl. That didn't seem possible so I ended up getting black welt cord and then covering it with the same Vintage vinyl. My lowly Tacsew industrial machine made this look good. I've since stumbled on another diy project where lawn trimmer line was used as the base for the welt cord. That would have made mine smaller and reduced the layers that have to be sewn. 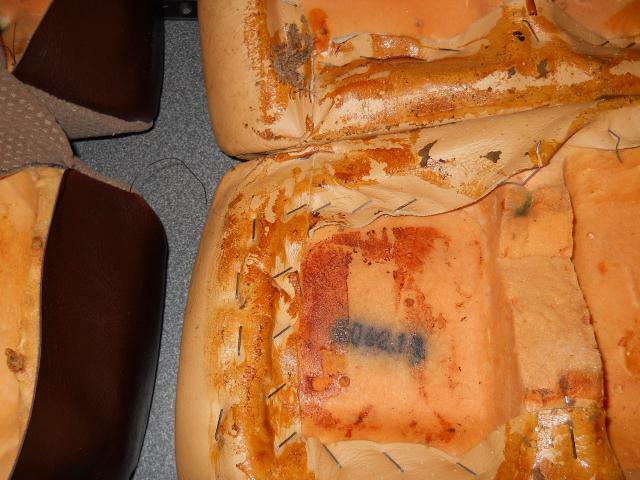 Here you can see how the bottom of the rear seat cushions look. 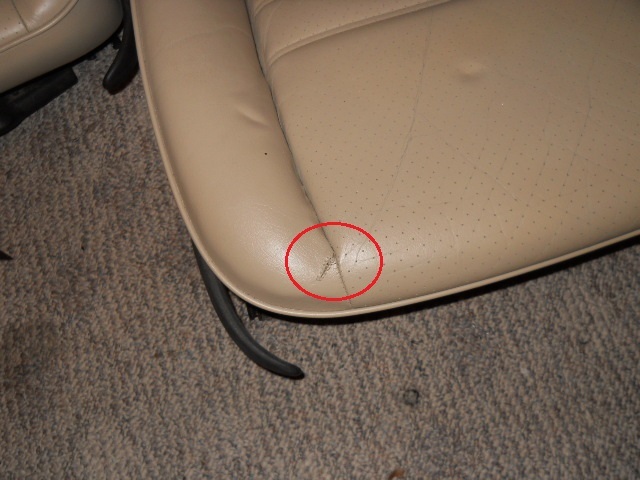 They are just stapled with some out-bending staples and then glued to the floor of the car. I later got the special staple gun for this job. Using the old covers as a pattern to make the new pieces is risky. On some, I kept the small side pieces attached at the end. 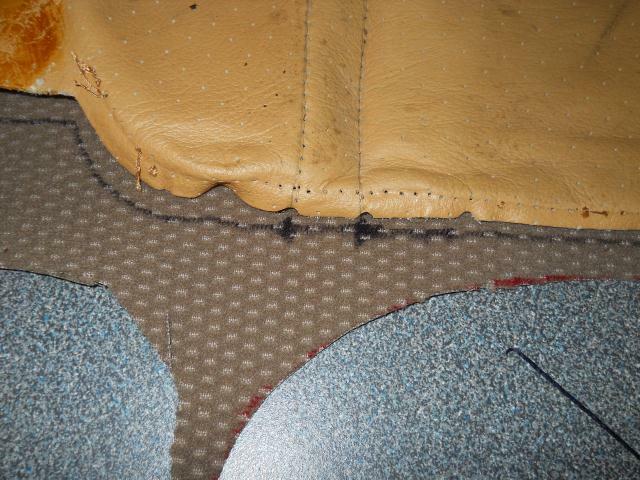 That turned out to be a good idea for a few times when I had to go back and know exactly where a seam starts and ends. This form of patterning is pretty shaky though. 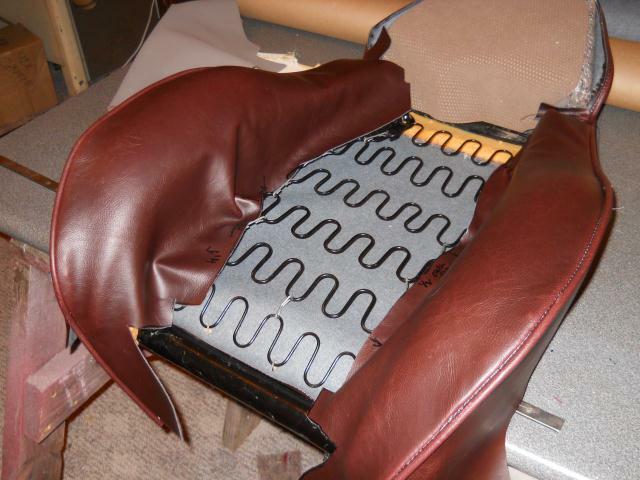 If the leather is stretched or somehow miss-shapened (which is very likely) then the pattern will be off and adjustments will have to be made to fitting the new pieces. Still, I had to start with something. Note the divots (diamonds) provided in the original as markers for the seams and overall alignment; the layout of the fabric has to be carefully situated so the seam follows the rows of the fabric's pattern (only had to re-do one of them, so far). These are far from done because they have to be glued/stapled but you can get an idea of how the colors will look. 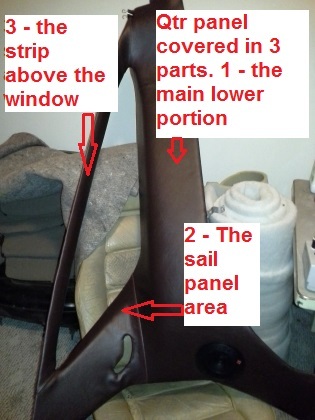 This seat back is done, getting the seam in the right place and matching the other seat could have been better though. I suspect that most people can sew the binding on the carpet's edge in one pass, but I'm not that coordinated and have to have two passes; and my line still waves a little. The first pass is done from the backside and gets the binding attached, then the binding is wrapped around and the finish stitch goes on the front side. 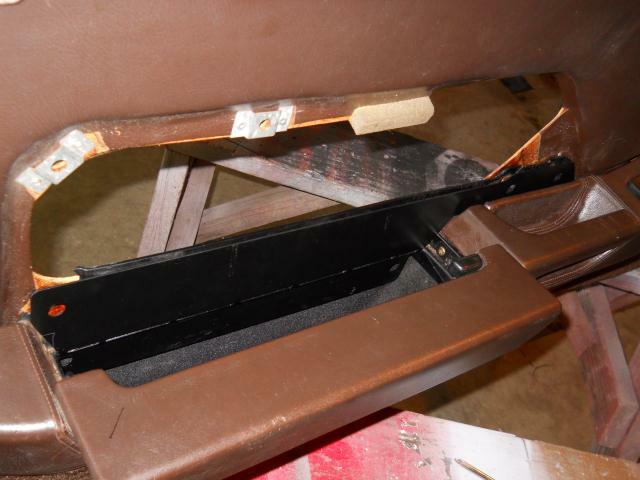 So today I finally got started on the front seats - I think this will be the hardest part of this whole effort. With the time it takes to first make the pattern, then cut the pieces and check everything twice, these progress pics took about 3 hours work. 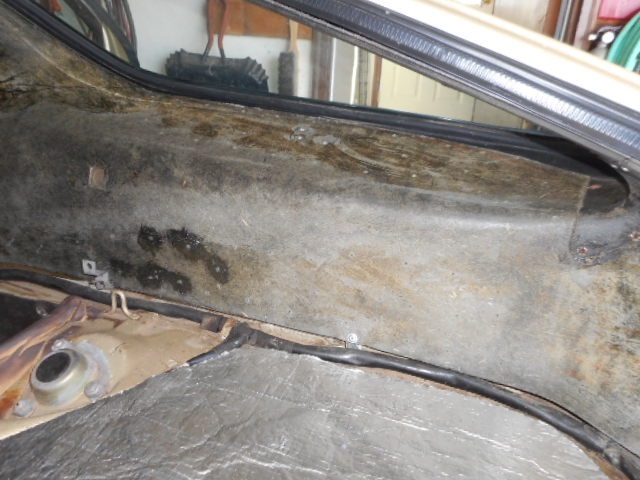 My earlier tracing of the shape of each piece worked ok for the back but the front seats are a little more worn and I was thinking I will probably have to re-do a seam or two to get things right. So for the front I made patterns of the pieces on some wrapping paper. 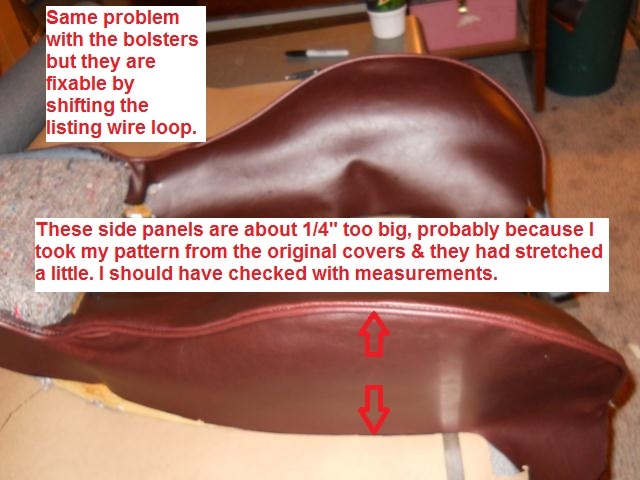 Thinking I would then make any adjustments to the pattern so that the second seat came out easier than the first. This worked kinda but I started to see some pattern problems. So a few adjustments are in order. In the background, you can see my pattern making paper. OK, today I cut open both the bolster seams to snug them up a little. It only took about an hour but at the beginning I had that funny feeling like maybe I should quit while I was ahead. They say a good carpenter can either fix his mistakes or hide them well. So here goes. Anyway, I'm glad I did. It wasn't that difficult and fixing mistakes is something I'm probably going to need to do over and over. Here are some pics. 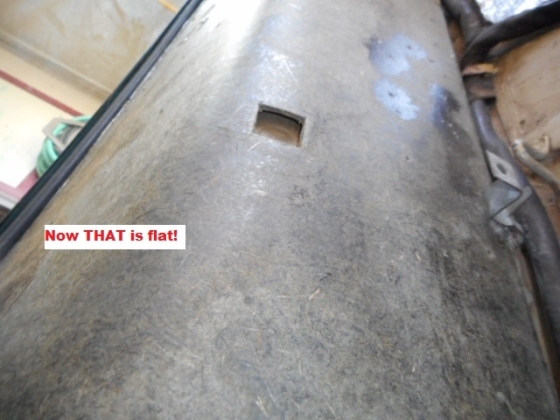 Next was my first look at the seam area above the bolster. I should have thought about this a little more. I did what I've been doing everywhere, start the stitch, then back up over with a lock stitch idea. I think now I should have done some sort of tied knot or something to make it neater. I need to study up more on how Porsche did that on the originals. This is a mess. 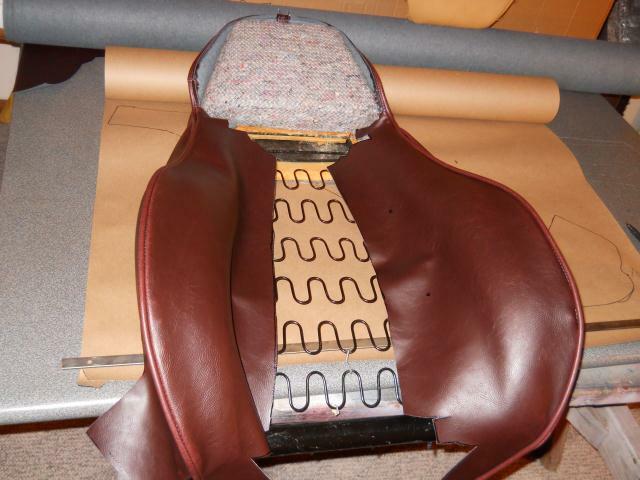 Also ran out to the store tonight to get the utility fabric (don't know the real name of it and neither did the lady at the store) to make the headrest listing. Well disaster struck during the final assembly of the lower cushion. I managed to tear one of the bolsters and this forced me to recognize that I was in deep water - maybe over my head. 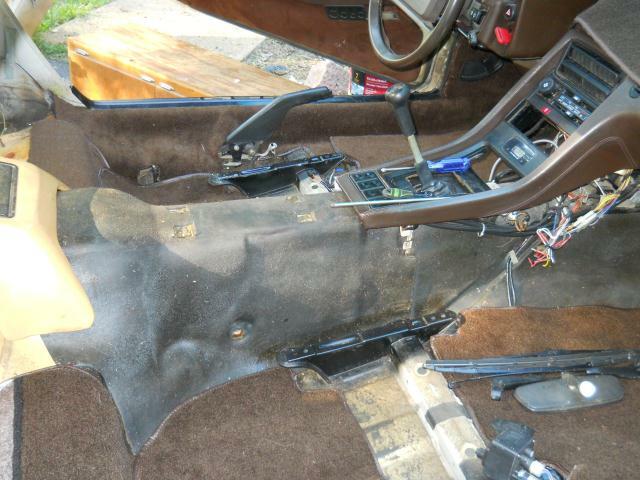 So after a few weeks of looking for options, one of my other projects came up - replacing a bolster panel 944 seat. I really needed to get this one done in order to get the car ready to sell. 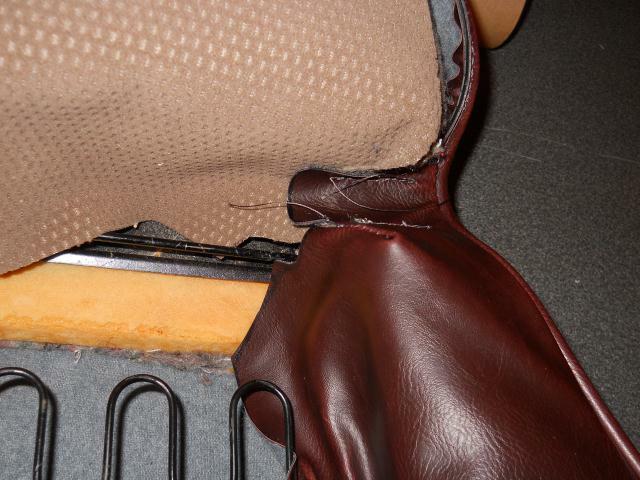 On it, I got the leather, used the old panel as a pattern, stained the leather to the right color and sewed it in. It went so well I couldn't hardly believe it. 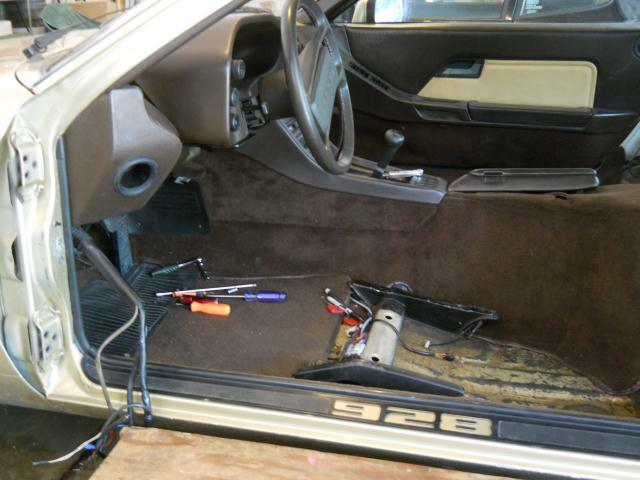 So eventually this experience brought me back to what I could do on the 928. 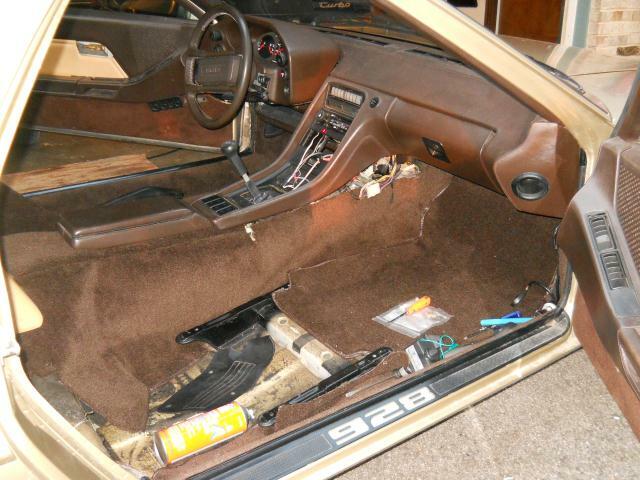 And this is what I came up with; 944 seats in a 928. I made the new covers for the 944 seats and of course thats an education it itself. 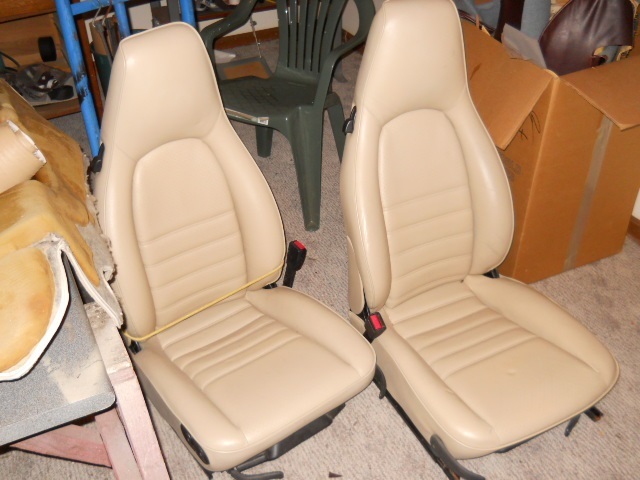 My self rating was D+ or one step up from those generic seat covers that fit everything for a 60's Rambler to a Fiero. So I got that first seat in the car and then started through another cycle of life where everything is put on hold. 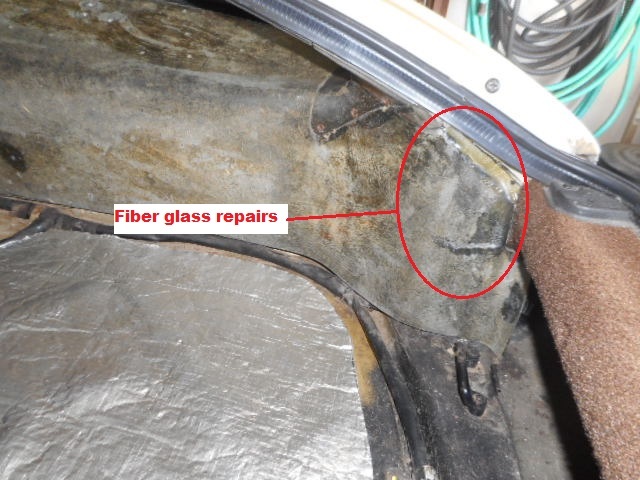 Two years later the the car has sat in the carport through all seasons, will not start and is covered in a nasty combination of tree sap, pollen and dirt. But, on the upside, I'm now personally equipped with a third kidney so I'm ready for the fight to resume. I drag my budget 928 back into the garage; rehab the brakes (again), totally clean-out the fuel injection system (again), put in a new rear main seal (again), mount up new tires, endure a two week intensive troubleshooting effort of all things electrical (mostly to find that yes, the 6-pin X plug can be inserted up-side-down). And yes the GM alternator does make fantastic amps but the 928 immune system (aka warning lights controller) does indeed detect and flag those alien amps when my unsteady idle falls below 800 RPM. Witch Hunter gets the call and while I wait for refreshed injectors and a steady idle; I finally get back to my trimmer effort. The rear console is finally done (another D+). 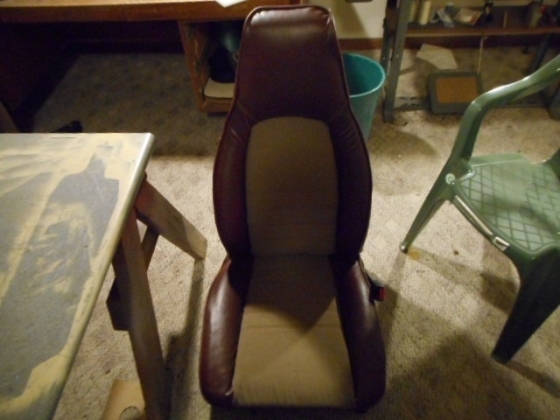 The rear seat side panels are done - twice (the second effort was a B). 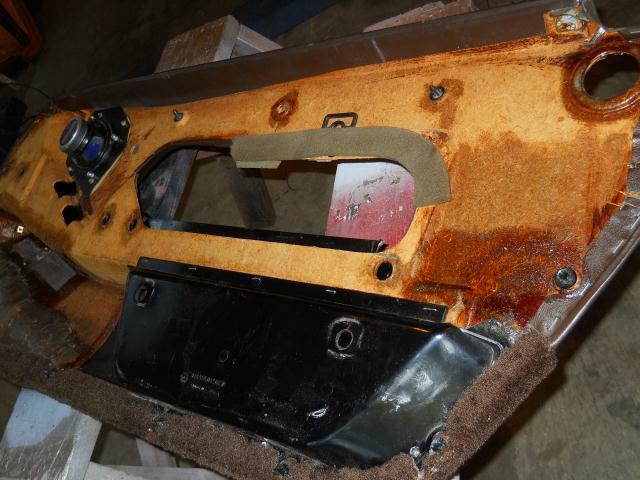 And that brings me to the most scary of all - covering the interior quarter panels. 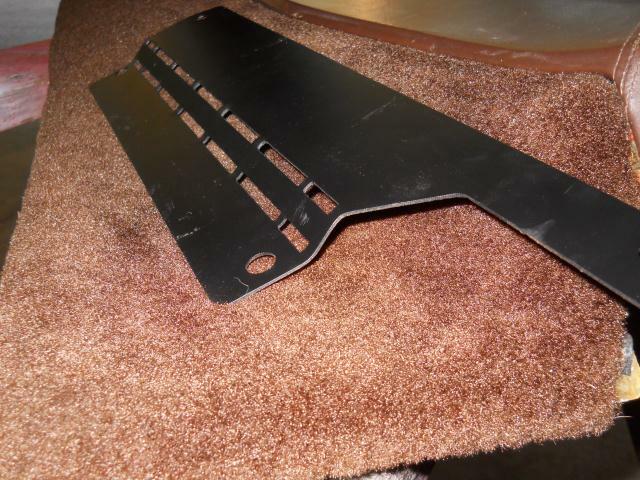 OK so, my quarter panels are stripped clean and flat. I have done small fiberglass repairs to the edges and now I'm finally ready to cover them with foam. 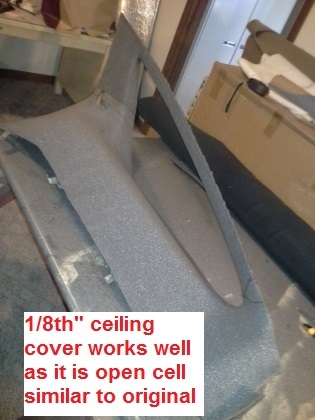 The nearest thing I could find to the original foam was automotive ceiling cover foam. It is available in 1/8 inch, with a fabric attached to one side. It is open cell and stretchy. Evenso I got my first insight to how much a single piece would have to stretch to cover. I settled on 3 pieces as shown below. I glued the fabric side down. Next is planning the cover and after much trial and error, I settled on a 3 piece approach with simple overlapping. 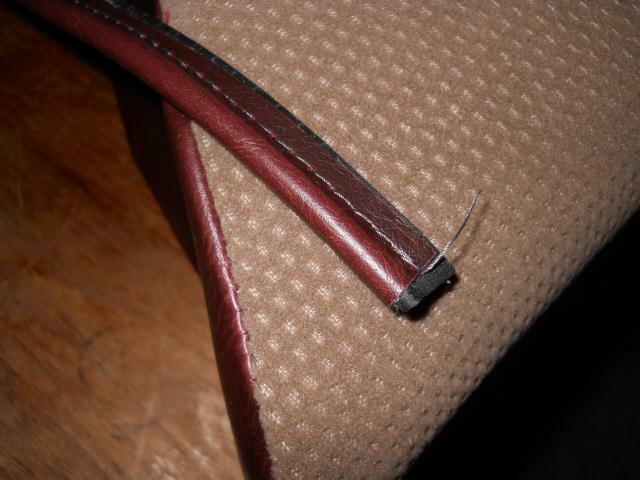 I hemmed the edge to create a simulated seam. First the cover is positioned and stapled along the perimeter. The the glue-up begins.